Given my recent good performances over 5km, which I can only attribute to getting my training and diet pretty much spot on, I decided I'd really go for it in yesterday's Yateley 10k and see if I could dip under 38 minutes for the first time in over 14 years. Given the route is mostly uphill for the first 3 km and has a "sting-in-the-tail" in the form of a slow incline and then a sharper short hill in the last 2km, I was a little apprehensive about achieving this goal, but I didn't let that put me off. Instead of taking heed of the "sting-in-the-tail" and saving something for the end, I opted for the approach of getting ahead of myself by the time I got to the last 2km and hope I can keep the pace up. After a bit of a quick start, which felt far too easy, I settled into a comfortable pace and ticked over the kilometres aiming to keep my average time per km well under 3:48. I pushed it a little more than I probably should have on the long downhill section and kept things pretty constant on the long flat between 5 and 8km. This method worked a treat and up to this point, only 1km was slower than 3:48 - the 8th. The 9th kilometre, as expected was much slower at 4:05, but thankfully not so slow I couldn't claw things back in the last kilometre. On entering the field for the finish, I looked up and was pleased to see the time on the clock approaching 37:45. That sub-38 was well within my grasp. So I dug in and sprinted to the finish coming in in under 38 minutes, pipping a chap at the line who passed me during my slower 9th kilometre. My watch said 37:57. I'd done it. 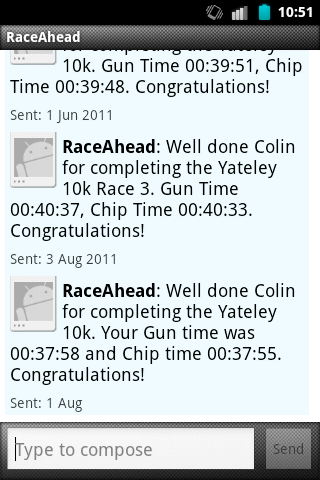 By the time I got back to my car, I'd received my official result text message (right): gun time: 37:58 chip time: 37:55!!! Last night's performance a whopping 50 seconds of my previous 10k PB (38:45) and a huge 1 minute 56 seconds off my previous best for this race (39:51). The Yateley 10k is deemed a slightly tough race so I'm very chuffed with myself for getting my first sub-38 10k in 14 years on this run. It does make me think what kind of time could I get over a nice flat 10k route. Think I'll have to see if I can find such a route and find out 🙂 . I can finally say I am a sub-38 minute 10k runner again. It's been a tough two years to get to this point, but it has been worth every minute of it.